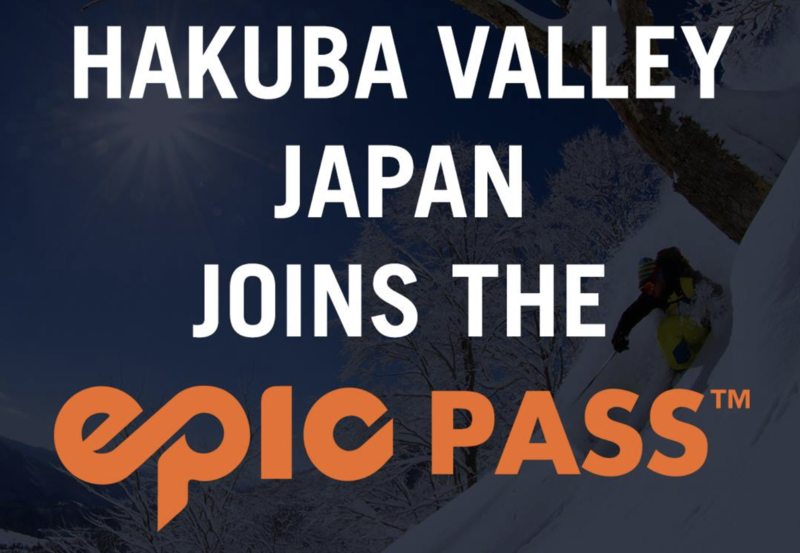 Hakuba Valley, Japan is the latest international destination to join the Epic Pass for the 2018-19 season. Hakuba Valley is located in the northern part of the Nagano Prefecture at the base of Japan's Northern Alps and played host to the 1998 Olympic Winter Games. "We are pleased to include Hakuba Valley among the world-class mountain resorts that offer the highest standards in skiing and snowboarding on the Epic Pass for skiers and snowboarders," said Hikaru Takanashi, chairman of Hakuba Valley Promotion Board. "Hakuba Valley is considered the heart and soul of skiing in Japan, with its natural beauty, vast ski terrain, and plentiful snow. We welcome skiers and snowboarders from around the world to experience our renowned hospitality." Epic Pass: Five consecutive days of skiing or snowboarding at Hakuba Valley with no blackout dates. The Epic Pass offers full access to Vail, Beaver Creek, Breckenridge, Keystone, and Arapahoe Basin in Colorado; Park City in Utah; Heavenly, Northstar, and Kirkwood in Tahoe; Stowe Mountain Resort in Vermont; Afton Alps in Minnesota; Mt. Brighton in Michigan; Wilmot Mountain in Wisconsin; Whistler Blackcomb in Canada; and Perisher in Australia (2019 ski season), with no blackout dates. The Epic Pass also features seven days with no blackout dates at Telluride in Colorado; up to six days with no blackout dates at Les 3 Vallées, Paradiski, and Tignes-Val D’Isere in France; up to five days with no blackout dates at 4 Vallées in Switzerland; up to three days with no blackout dates at Arlberg in Austria; and up to three days with no blackout dates at Skirama Dolomiti in Italy. Epic Local Pass: Five consecutive days of skiing or snowboarding at Hakuba Valley with no blackout dates. Unlimited and unrestricted skiing or snowboarding at Breckenridge, Keystone, Arapahoe Basin, Wilmot, Afton Alps, and Mt. Brighton with limited restrictions at Park City, Heavenly, Northstar, and Kirkwood, plus a total of 10 days at Vail, Beaver Creek, Stowe and Whistler Blackcomb with holiday restrictions. Epic Australia Pass: Five consecutive days of skiing or snowboarding at Hakuba Valley with no blackout dates. Unlimited, unrestricted access to Perisher during the 2018 season, and access to Breckenridge, Keystone, and Arapahoe Basin in Colorado; Park City in Utah; and Heavenly, Northstar, and Kirkwood in Tahoe; and 10 days at Whistler Blackcomb, Vail, Beaver Creek and/or Stowe, combined, during the 2018-19 season. All North American resort access is subject to certain holiday restrictions. Visit EpicPass.com for more information and to secure your 2018-19 season pass beginning on Tuesday, March 6th.